This refreshing and healthy detox water is the perfect summer thirst quencher. Hydrating + soothing cucumber is combined with invigorating ginger and lemon for a crisp and revitalizing infused water. 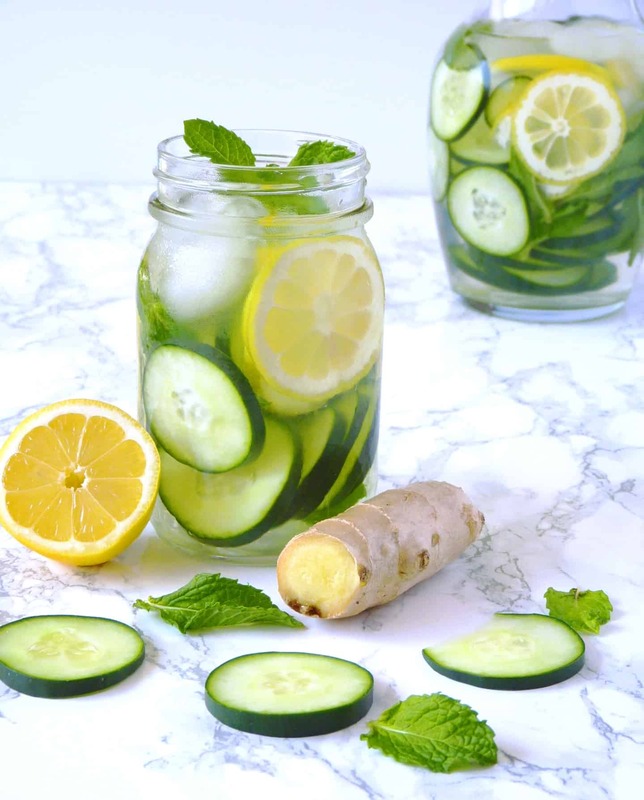 Fresh mint leaves add a cooling yet energizing component to this delicious cucumber lemon ginger water. Infused water, also known as “detox water”, is a great way to add nutrients and flavor to your water without adding extra calories. While you won’t get all of the nutrients that you would be getting by eating the ingredients, detox water is still able to soak up the water soluble vitamins and minerals of whatever it is infused with. Consider this a bonus compared to just drinking normal water. The delicious flavor also makes it easy to consume your daily recommended 8+ cups of water. With so many different detox water flavors to try, your taste buds will never get bored! Maintaining proper hydration is one of the easiest – yet often most overlooked – ways to stay healthy and lose weight. So let’s take a look at some of the added health benefits you can expect from drinking cucumber, lemon, ginger, and mint infused water. They are particularly good for skin health and are used in a variety of revitalizing and anti-aging skin care products. Their cool, refreshing flavor is perfect for infused waters and goes great in this Strawberry Detox Water. Lemon juice is great for detoxification. It helps stimulate the liver (the body’s natural detox center) and aids the digestive tract to keep things running smoothly. Ginger has been used medicinally for centuries, primarily for its anti-nausea properties. It’s also a common ingredient in modern day wellness shots. The same phenolic compounds that make ginger great for easing nausea also make it a great anti-inflammatory food. Ginger is one of the main ingredients in this delicious anti-inflammatory Pineapple Turmeric Smoothie. Mint is another great digestive aid. Its soothing properties can aid with nausea and headaches. Perhaps one of the best parts about detox water is just how easy it is to make. Simply slice up the ingredients, add water, and let it sit so that the flavor and nutrients can infuse into the water. But if you really want to step up your infused water game, follow these 4 simple tips and you’ll have the perfect detox water in no time! Infuse for 2+ Hours – The flavors and nutrients won’t infuse into the water straight away. I generally make my detox water the night before and let it infuse in the fridge over night. Infuse at room temp – Basic chemistry says that water based reactions happen faster at higher temperatures. Let your water sit at room temperature if you want to speed up the infusion – just don’t leave it out for more than a few hours unrefrigerated. Thinly slice – Another way to speed up the infusion process is to thinly slice your ingredients. This makes it easier for the water to soak through and absorb all the wonderful nutrients and flavors! Detox waters are a super simple way to stay hydrated, get extra nutrients, and even lose weight. But if you really want to take your detox and weight loss to the next level then I recommend trying these at home detox juice cleanse recipes! Don’t have the time to make all of your juices yourself? Let the professionals make a juice cleanse for you! (This one is my favorite). A refreshing and thirst quenching detox water. Soothing cucumber is combined with stimulating ginger, invigorating lemon, and cooling mint for a crisp and revitalizing infused water. Combine all ingredients in a large glass pitcher and enjoy! « Vitamix 5200 vs. 5300 – Which is best? Does this help with Diabetes? Detox water is a great drink if you have diabetes because it is a way to flavor your water without adding any excess sugar. This makes water easy and delicious to drink, and proper water intake has been shown to help control blood glucose levels. If you or somebody you know is struggling with diabetes I also recommend adding chard to your diet. This leafy green has an antioxidant called alpha lipoic acid which has been shown to increase insulin sensitivity and lower glucose levels. I use chard in this smoothie, but it can be substituted for kale or spinach in any smoothie recipe! HI I would love to know how long does it take to see results or should i see any effects that are signs that it works for me? That will depend on exactly what results you’re looking for. The stomach calming properties of ginger and the soothing yet invigorating mint is subtle but can take effect almost immediately. If you’re drinking detox water for weight loss or to help your detox organs like the liver and kidneys properly function and rid your body of toxins then the answer is a bit more complicated. It really depends on your body and a number of other factors so it will differ from person to person. Staying hydrated is key for weight loss and to insure your body’s natural detoxification processes in the liver and kidneys are functioning properly, and detox water is a delicious way to keep hydrated and get your daily recommended amount of water! Good luck with your weight loss! Keeping properly hydrated is a crucial first step on the journey. Distilled water is perfectly fine to make this with. I personally prefer to use filtered water though because it still has important minerals like calcium and magnesium in it. Hey! This sounds nice, will you keep it always in the refrigerator and how long will you use each glass jar. I keep it in the refrigerator and I continue to refill the jar until it starts to lose flavor. I usually make a new batch every 2-3 days depending on how often I’m drinking it!